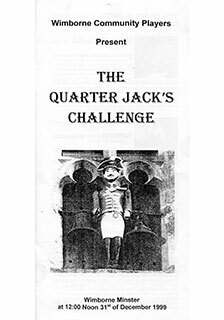 The Quarter Jack, who has resided on the Minster tower for over two hundred years, steps down to issue a challenge to many of the town’s most worthy residents over the last thousand years. He invites them to compete for the title of ‘Wimborne Worthy of Worthies’. Characters invited: St Cuthburga, founder of the Minster Church, Lady Margaret Beaufort, mother of Henry VII, Thomas Hardy, Isaac and Elizabeth Gulliver, Henrietta Bankes of Kingston Lacy, and her servant, Alice Maud Baker and wise woman, Alicia Payntere. The production was part of Wimborne’s Millennium celebrations and was funded by Wimborne Town Council. It was repeated as part of the Wimborne Folk Festival the following year in June 2000.